Your ‘copy-and-keep’ guide to those Brexiteer EU referendum promises. Were ANY of them true? 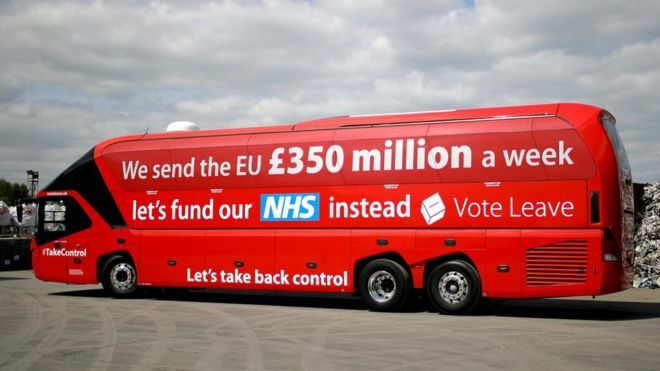 ‘£350 million a week for the NHS’ – a Leave campaign lie [Image: BBC]. A website entitled Open Britain has provided a handy guide to some of the promises that were made by ‘Leave’ campaigners in the run-up to the EU referendum. This Writer thought it would be worth re-publishing them, now that Brexit negotiations are under way, so we can all follow progress and tick off those promises as they are met! In fact, we already know that some of these promises are complete hogwash. For example: New trade deals with other countries and power blocs won’t be in place immediately after the UK leaves the EU. The EU has made it clear that the UK may not start to negotiate any such deals until after it has left. And what about the vexed issue of border controls with the Republic of Ireland? In fact, I would like to open this up to all of you. Read the list below. If you can provide proof that supports – or refutes – these claims, please send it in and I will add it to the article. Let’s keep this going as the negotiations continue, so we can see for ourselves exactly how accurate – or not – the Brexiteers’ claims turn out to be. “The EU’s supporters say ‘we must have access to the Single Market’. Britain will have access to the Single Market after we vote leave”. Vote Leave, What Happens When We Vote Leave? 27. Continue and deepen cooperation with the EU on science and counter-terrorism. “In particular, we will negotiate a UK-EU Treaty that enables us 1) to continue cooperating in many areas just as now (e.g. maritime surveillance), 2) to deepen cooperation in some areas (e.g. scientific collaborations and counter-terrorism)”. Vote Leave, What Happens When We Vote Leave? 37. A new UK-EU treaty by the end of 2018. “Given that all the big issues have already been solved over the years between the EU and countries around the world, and there is already a free trade zone stretching from Iceland to the Russian border, the new UK-EU Treaty should be ready within two years. In many areas we will continue existing arrangements at least for a while. Obviously the relationship will change and improve over time but a main goal for the first phase is to avoid unnecessary disruption. All the important elements of a new Treaty should be in place well before the next election.” Vote Leave, What Happens When We Vote Leave? 38. Construction of a new European institutional architecture. “We will build a new European institutional architecture that enables all countries, whether in or out of the EU or euro, to trade freely and cooperate in a friendly way.” Vote Leave, What Happens When We Vote Leave? they have already reneged on the immigration promises, kicking out people who were asked to come and work in essential services like the nhs. they are not looking for new immigrants to fill jobs that are needing them now, not in 10 years or more time, where doctors and nurses are concerned. they are also looking to reduce workers rights and lowering wages so no rises are on the cards any time in this parliament. they are looking to reduce corporations taxes even more but also trying to kill off more poor, ill and disabled. all they have is smoke and mirrors and that so called cash mountain we pay to the EU is not there. Perhaps you can name one person who is working in the NHS who has been kicked out of the country, especially as we are still in the eu, and legally can not, or is that just another piece of remainer fiction? Perhaps you can tell us exactly which workers rights, most of the rights in the eu were already in the UK before the other nations accepted them, or is this just speculation? We are in the eu we are under eu regulations and the last few government s have been making life harder for unemployed sick and disabled, so how exactly is membership protecting us? The £350 million remain like to say is wrong, is indeed wrong, it has been discovered it is more than £600 million. It was £175 million, or thereabouts. Well yes, who would have thought the eu would be so self harming and waste time they should be negotiating on making illegal demands, even leave didn’t think they would be that stupid. They haven’t made any illegal demands. Most are blatant barefaced lies, but also an element of cloud cuckoo land from some extremely nasty and dishonest politicians (Johnson a proven liar who was dismissed from a job for dishonesty: Davis a self-confessed liar). They forgot to mention that in the early 1970s, prior to joining the EEC, Britain was the sick man of Europe”. I remember that well. Well I was there, and no we were not the sick man of Europe, that was just pro common market lies, the propaganda machine has continually been in motion to fool people into thinking we had to remain in it eve since. Try looking at how many complete industries we have lost due to membership. We lost our industries because Margaret Thatcher and her cronies wanted to build up unemployment as a threat in order to cut wages. Well listen to anna soubry and you can balance it out with fresh female bovine BS. Mike much of what you post is excellent and nearly always 100% accurate and I am extremely grateful for the info and insights you provide, but, please, in this case, lets not fall foul to some of the malpractices we accuse main stream media of continuously doing. This list of ‘promises’ could never ever be regarded as promises. The referendum was called by David Cameron and his government and they were the only ones in a position to guarantee what ‘promises’ if any were given, would be enacted. This list has been prepared by a new group called Open Britain whose objectives remain far from being clear and its membership seemed to derive from disgruntled MPs who are unhappy about the referendum result, who are unhappy with Jeremy Corbyn, and who may be unhappy with the present government and its awful leadership. This list is no more than a summary of possible options which could be exercised if a government so chose. It’s a summary of all the arguments that were used to sway people into voting ‘Leave’. As such, it deserves our continued scrutiny now. Are we to believe that you are a Leave supporter, disgruntled that these claims are being examined now that negotiations are taking place? Why should they not be checked? These are the reasons people voted to exit the EU – it is right that we should do this. And bear in mind: I haven’t said that they’ll all be found lacking. Although I take your point about scrutiny, Mike, I happen to agree with what I believe is the gist of what Andrew is saying. Many of the items in the list are aspirations and possibilities, which, in truth, is all that any campaign group that wishes to leave the E.U. could do. As I have said, many times, only the government of the day can make any decision and no government, I believe, is bound by assertions that it did not make. These are not manifesto pledges and as such, cannot be forced upon a body that did not make them. We did not vote for the £eave Campaign. This was a referendum, not an election and I made this point during the campaign, on my facebook page and to all of my pals, in person, when discussing the issues. The question on the ballot paper was about our membership of the E.U., which his why it was important that people understood and understand what it is, what it does, what it is supposed to do how it works etc. and why I posted the E.U. Treaties on my facebook page, so that people could have this information, unfiltered and unbiased, first hand. I am still waiting for even one question to be answered by any of the politicians, M.P.s and ministers to whom I sent my list of pertinent questions. NOBODY, to this day, has answered a single question. The only direct response that I received, with respect, came from a £abour source, who confessed to not knowing the answers. How can you campaign, one way, or the other, when you don’t know what you are actually campaigning for? This was the real problem and why we should not have had the referendum until this year, as was initially timetabled. There are many things on the list, which begin, “let’s imagine.” These can hardly be considered promises, or even pledges. They are merely possibilities, which was the whole point of the leave campaign; what might be possible, because we hadn’t left and the future of the U.K. apart from the E.U. was one that we could create, albeit within certain parameters. Do you honestly believe that, had £abour won the election, the things on this list would be put into action? This is why I am angry with Parliament, because this point should have been made clear, when the referendum Bill was passed. The public should have been given more, better and relevant information. We must be careful not to call all of the things in the list lies. Some are untrue, some inaccurate but others might be called wishful thinking, some speculation, aspiration, possibility and must be considered within the workings or our political structures. Remember, both sides said things which could be considered untrue and much of what was said was pertaining to the future, which is unwritten; like weather forecasting, is it subject to interpretation of the information that is at hand at the time and this is subject to change. Do we demand the heads of those who say that the weather will be fine, when, subsequently, it rains? As I said, before, there were more predictions made during the referendum campaign than in the whole of Biblical time. NOBODY knows what the future holds. Open Britain hasn’t misled anybody, though. All they did was quote the claims made by the leaders of the ‘Leave’ campaign and all I have done is said, hey, let’s monitor what happens and see how many of these claims prove to be accurate. Why are some people getting upset about that? Unfortunately the underestimate of what it costs us to be in the eu it is actually over £600 million a week, has been hijacked by people who pretend it meant promise when it was a suggestion, how could a campaign simply set up to fight a single issue then to disappear make any promises? remain of course you could say promised us armageddon if we left, it seems they are trying their hardest to create that by not accepting they lost. It was a lie, is what it was. Actual cost to the UK was nothing like £350 million a week – it was more like £175 million a week. So the claimed amount could never have been given to the NHS in any case. ‘It’s a summary of all the arguments that were used to sway people into voting ‘Leave’’ Not ‘promises’ ? I am a leave supporter but I am not in any way disgruntled at the examination of anything which was said or printed. Most of it was piffle and hogwash, which manifested from both sides. I just want to be able to read what you write and not have it sullied by influences which clearly should not be there. Well, you’re as welcome to submit evidence as anybody else, so why not do that? Right now you can see most, if not all, are lies. Straight away they came out with the NHS could, not would, benefit from leaving the EU? 60% cut in council tax I would take that but that’s just another lie. they’ve but working tax credits from £5800 to around £3500 before you lose money if their intention is to raise it in succsessive budgets after 2019 to what it was before the cut that’s another lie mascarading as a truth. Who are “They”? The £eave Campaign, or the government? The ‘Leave’ campaign. Are you trying to muddy the issue? Even if we just get back our border then voting leave will have been worth it. People seem to be confusing the £eave Campaign with the government. The £eave Campaign can’t do anything, the government can. It is up to the government to adopt, or not, any of the things that the £eave Campaign said. Even if they were all truths and possible, there is nothing, as far as I am aware, that says that the government has to put any of them into action. The £eave Campaign is not accountable for anything that happened after the referendum. We did not vote for the £eave Campaign, we voted to leave, there is a big difference. We voted for a Tory government, albeit a minority one; that IS accountable. When will people stop blaming the Campaign for the actions of the government? People voted to leave, based on what the ‘Leave’ campaign told them. If the ‘Leave’ campaign told them something would happen and it doesn’t, then the ‘Leave’ campaign lied to them about that and their vote was based on a lie. And what about the fact that many of the people in the ‘Leave’ campaign also happen to be members of the government, including David Davis? We did not vote for a Tory government, by the way. They do not have a majority in the House of Commons, therefore they have no mandate. Mike people voted leave, as those who voted stay, based upon what they felt after consuming what they considered was important. If you look at the reverse scenario, those who supported remain, did they believe what Cameron said as being ‘the whole truth and nothing but the truth’ ? So you agree that it is right for us to consider whether the information they considered important was accurate? If so, then we have no argument. We have no argument from the outset. What was said or implied was meant to be misleading. But it was the same for both sides. The only thing which is relevant in my mind, is this absurd point of view that these were ‘promises’. Open Britain produced this list and there is no reason why they should not, but these were not ‘promises’. I question why Open Britain produced this list when the opposition could easily point to the ‘promise’ of David Cameron not to quit whatever the referendum result. He can be truly blamed for broken promises. I agree with you about Cameron. I’m pleased we are not at odds. If the ‘Leave’ campaign was not in a position to make its promises, it should not have made them. It is a campaign that included among its people many members of the government of the day – and the government now. The point that I have been trying to make is that people are expecting government to enact what a Campaign group said. The Campaign group could only talk about possibility, speculation and aspiration, because 1) being a campaign group, it is in no position to carry out anything that it said, 2) the future is unknown so, it could not guarantee anything, even if it were in position to carry those things out. I have read comments and people are talking about the £eave campaign, as though it IS government and this is an important distinction. No, I am not trying to muddy the waters, at all but clear them. There seems to be much confusion with regard to to who is accountable and who has the power to do anything. Despite the fact that members of the government were in the £eave Campaign, it was not government and had no manifesto and people did not vote for it; it can do nothing, only government can; this is why I maintain that Parliament let us all down; all of this should have been put into law, when the referendum Bill was passed. To this day, how many people have even bothered to find out about the E.U., what it is, how it works etc.? This is big problem. There is much discussion about what was said and by whom but still people don’t know the first thing about that for which they voted, on either side of the debate and our politicians are still not furnishing people with this information and it seems, to me, that people, themselves, are not seeking it out. People need a political education but what government wants an electorate that understands and realises that it has the power and not the politicians? I say, again; we have become a nation of sleepwalkers but the people do not realise that they are being fed sleeping pills. People voted on what the campaign group said. If the government doesn’t enact what the campaign group said, then the campaign group lied. Remember, members of that campaign group are members of the current government. If they didn’t think they could enact what they were suggesting, they shouldn’t have put it forward. The Campaign group was not party political, though. It was merely a Campaign group and not in a position to make any promises, nor policy, only to talk about what might be possible. This is one of the things that I tried to make clear, during the referendum and what everybody should have been aware of. Remember, we were only asked to vote on whether we should remain members of, or leave the E.U., nothing else. If the government chooses not to enact what the Campaign group said, it is for government; the Campaign group cannot be blamed, nor held accountable. If the Campaign group said things which it knew to be impossible; that is a lie. Everything else was aspiration. There was no manifesto and we were not voting for the Campaigns; either of them. This is really important for people to understand. Neither Campaign can be held accountable, because they were merely campaigns, not governments-in-waiting. NOBODY knew what the future held. Of course, the £eave Campaign couldn’t enact what they put forward, because they are not government. That is the point. Only government can put anything in into practice and this is where Parliament should come into its own. Believe me, regardless of which way I voted, I am furious with the way in which our politicians failed us all. Call-me-Dave should have kept his word but the rest of the House and the £ords should have made sure that the Electorate had all of the information that it needed in order to make an informed decision based on the question on the ballot paper; they did not. Too few people, in control of the debate, knew the first thing about it. I have written to both Tim Farron and Vince Cable, since the referendum and have yet to hear from either of them. This is still an incredibly important issue yet nobody is telling the electorate what it needs t o know!